A perfect casserole dish for potluck dinners. Serve as an entrée or a side dish. Preheat oven 350°F. Cook pasta al dente according to package instructions and drain. Coat an 8x8 baking dish with nonstick cooking spray. In a medium bowl, mix together cooked pasta, egg, Parmesan cheese and butter. Spread evenly over the bottom of baking dish. Sprinkle 1 cup of mozzarella cheese over the pasta mixture. Spoon Pasta Sauce evenly over cheese. Bake uncovered for 30 minutes. 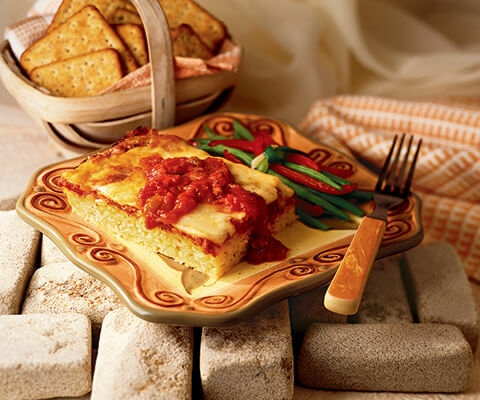 Sprinkle remaining 1 cup of mozzarella cheese on top and bake for additional 5 to 10 minutes, or until cheese is melted. Allow to rest for 5 minutes before serving. Use 2 tsp dried oregano leaves instead of fresh oregano, if desired. Delicious! I added a half pound each of cooked ground beef and hot Italian sausage to the pasta sauce before baking. We had company for dinner and we all loved this dish! man, is this one good!